Noah Bressner/Managing Editor Junior guard Everson Davis scored 17 points in the Bearcats’ victory over Hartwick on Sunday. Junior forward Thomas Bruce was too strong to be kept from the rebound and too big to be kept from the basket. Time and time again, Bruce collected a rebound and slammed down a dunk. In all, he collected eight boards and tallied 23 points despite playing just five minutes in the second half. 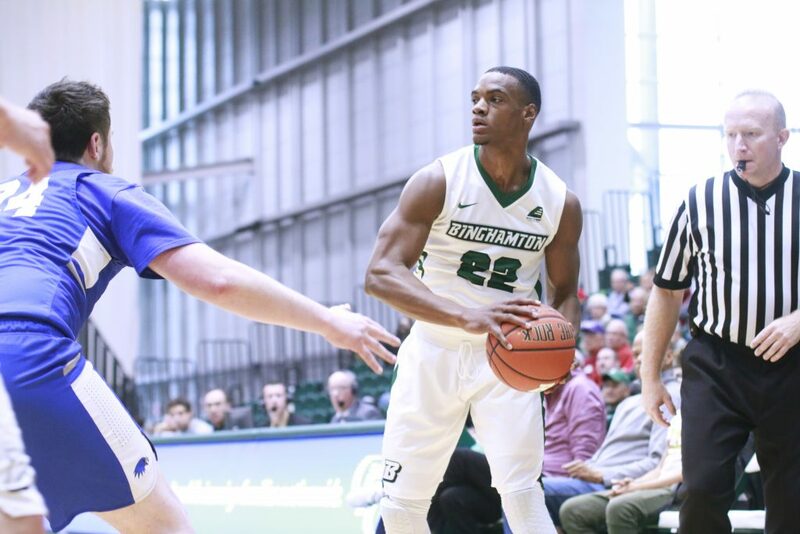 Combined with a 17-point performance from junior guard Everson Davis, Bruce led the Binghamton men’s basketball team to a 97-65 victory over Hartwick on Sunday. Bruce, who has notched three double-doubles so far this season, came up just short of his fourth against the Hawks (1-2) while shooting 10-for-10 from the field — a program record. Seven games into the season, his role on the team has grown to include almost everything. While BU (3-4) was never truly threatened by the Hawks, a Division III team scheduled as a buffer between a weeklong trip around North America for the Cancun Challenge and the rest of regular-season play, it struggled more in the first half than a Division I program should against Hartwick. Binghamton scraped a nine-point lead going into halftime before breaking out in the second. The Bearcats shot a 52.7 percent clip from the field on Sunday, but struggled from beyond the arc. BU went nine-for-33 in 3-point range, including just 18.8 percent in the first half. Junior guard J.C. Show tallied 15 points, while junior guard Timmy Rose led Binghamton with seven assists. Sophomore guard Fard Muhammad largely took over late in the game when Binghamton’s edge became irreversible and its starters largely headed for the bench, tallying nine points, two rebounds and an assist. Dempsey aimed to play as many players as possible against the Hawks — 10 Bearcats played in the first half alone. Freshman guard Kevin Townes and senior guard Corey Baker led Hartwick with 15 points each. Baker went five of six from the 3-point range while tallying four steals. Binghamton struggled to keep the Hawks away from the 3-point line as a whole, allowing the Hawks to shoot 40 percent from beyond the arc. The Bearcats went 1-3 in the Cancun Challenge, losing to George Mason and Evansville before splitting a pair of games against Montana State and CSU Northridge in Mexico. Binghamton is set to face Delaware State on Wednesday. Tipoff is scheduled for 7:30 p.m. from Memorial Hall in Dover, Delaware.